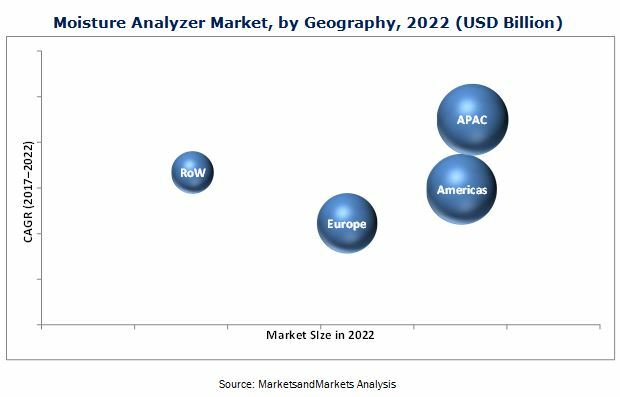 [157 Pages Report] The moisture analyzer market is expected to grow from USD 1.15 Billion in 2016 to USD 1.41 Billion by 2022, at a CAGR of 3.3% between 2017 and 2022. The moisture analyzer market is mainly driven by factors such as increasing demand from traditional as well as new verticals and rapid adoption in Asia. For this study, the base year considered is 2016 and the market forecast provided is between 2017 and 2022. The sizing of the moisture analyzer market has been done by the top-down and bottom-up approach. The bottom-up approach has been employed to arrive at the overall size of the moisture analyzer market from the revenues of key players (companies) and their share in the market. Calculations are made on the basis of the number of moisture analyzers used in each type of applications and verticals, which is further multiplied by the production of various applications for all major countries. Finally, the volume is multiplied by the average selling price of each moisture analyzer to arrive at the overall market size. In the top-down approach, the overall market size has been used to estimate the size of the individual markets (mentioned in the market segmentation) through percentage splits from secondary research (including the study of associations, databases, journals, and primary research). For the calculation of specific market segments, the most appropriate parent market size has been used to implement the top-down approach. The moisture analyzer ecosystem comprises major players for the moisture analyzer market. The key players in the moisture analyzer market are PCE Instruments (Germany), Michell Instruments Inc. (England), Ametek Inc. (US), SpectraSesnsors Inc. (US), General Electric Co. (US), A&D Co., Ltd. (Japan), Kett Electric Laboratory (Japan), Mettler-Toledo International Inc. (US), Sartorius AG (Germany), Shimadzu Corp. (Japan), Gow-Mac Instrument Co. (US), Mitsubishi Chemical Holdings Corp. (Japan), Sinar Technology (England), Thermo Fisher Scientific Inc. (US), and U-Therm International (H.K.) Ltd. (Hong Kong). All these companies have their own R&D facilities and extensive sales offices and distribution channels. The products of these companies can be used across various verticals for various applications. The report provides the competitive landscape of the key players, which indicates their growth strategies in the moisture analyzer market. Further breakdown of the application segment, by equipment type. The moisture analyzer market is expected to grow from USD 1.15 Billion in 2016 to USD 1.41 Billion by 2022, at a CAGR of 3.3% between 2017 and 2022. The moisture analyzer market is mainly driven by factors such as increasing demand from traditional as well as new verticals and rapid adoption in Asia. The moisture analyzer market is segmented on the basis of analyzing techniques, which include Karl Fischer titration, loss-on-drying, capacitance, microwave, drying oven, near infra-red, radio frequency and others. Among these techniques, the market for near-infrared (NIR) technique is expected to grow at the fastest rate between 2017 and 2022. This is mainly because NIR analyzers provide the opportunity to measure moisture content in the product during the manufacturing process. With the growing process automation in various industries, the demand for in-line moisture analysis is growing, and NIR analyzers are the best fit for the continuous analysis of moisture during the product manufacturing process. The moisture analyzer market segmented on the basis of equipment types such as desktop-mounted, handheld, and in-line. The market for the in-line equipment type will grow at the fastest rate among others during the forecast period. This is mainly because of the growing process automation for manufacturing of products in various industry verticals, which is ultimately generating the requirement of moisture analysis during the production process. The in-line moisture analyzers can be mounted on production belts for continuous detection of the moisture content level in the produced material for quality check and to make possible changes based on the measurement to ensure high-quality end products. The food and beverage vertical accounted for the largest share of the overall moisture analyzer market in 2016 and will grow fastest among others during the forecast period. This huge demand from the food and beverage vertical can be attributed to the stringent government regulations for maintaining the high quality of edible products by maintaining the moisture content in the product at the desired level. The pharmaceuticals vertical is expected to be the second-fastest market for moisture analyzers closely followed by water treatment and biomass vertical. The moisture analyzer market has also been broadly classified on the basis of geography into the Americas, Europe, Asia Pacific (APAC), and Rest of the World (RoW). The APAC region will grow at the fastest rate during the forecast period. This is due to the ongoing industrial development, rising awareness about the benefits of process automation, environmental concerns, and government programs in the developing countries of APAC such as China and India to promote green initiatives that help in reducing pollution. The stability and reliability issues of moisture analyzers inhibit the market growth. Furthermore, for the moisture analyzer market, the lack of highly skilled staff is a major challenge and expected to remain in the near future. However, factors such as the growing process automation leading to the high demand for in-line moisture analyzers and technological advancements resulting in more reliable heat-based moisture analyzing can generate significant opportunities for this market. Some key players in the moisture analyzer market are PCE Instruments (Germany), Michell Instruments Inc. (England), Ametek Inc. (US), SpectraSesnsors Inc. (US), General Electric Co. (US), A&D Co., Ltd. (Japan), Kett Electric Laboratory (Japan), Mettler-Toledo International Inc. (US), Sartorius AG (Germany), Shimadzu Corp. (Japan), Gow-Mac Instrument Co. (US), Mitsubishi Chemical Holdings Corp. (Japan), Sinar Technology (England), Thermo Fisher Scientific Inc. (US), and U-Therm International (H.K.) Ltd. (Hong Kong). 11.12.2 Mitsubishi Chemical Holdings Corp.
11.12.4 Thermo Fisher Scientific, Inc.
11.12.5 U-Therm International (H.K.) Ltd.